Posted April 16, 2014 by iwadmin & filed under iboga treatment. Many people are aware of the first stage of withdrawal when detoxing from drugs and/or medications such as opiates. But doctors and rehabilitation centers may not educate patients on the second stage of withdrawals which is called Post Acute Withdrawal Syndrome or PAWS for short. During this stage you’ll have less intense physical symptoms, but more emotional and psychological withdrawal symptoms. Post-acute withdrawal occurs because your brain’s receptor sites are repairing, your brain chemistry still isn’t at normal levels. When a person becomes addicted to opiates, their brain doesn’t make as many receptor sites that control pleasure. It does this due to the body’s defense mechanism since the brain was being flooded with opiates continuously. This lack of pleasure is also called dysphoria. As you heal, the levels of your brain chemicals fluctuate as they approach the new equilibrium causing post-acute withdrawal symptoms. Post-acute withdrawal can be challenging. In the beginning, your symptoms will change minute to minute and hour to hour. Later as you recover further they will disappear for a few weeks or months only to return again. There is no obvious trigger for most episodes and symptoms can come and go throughout the day. 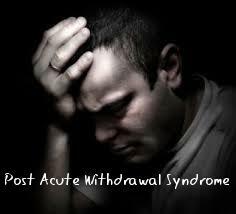 Post-acute withdrawal symptoms can last for 2 years depending on the individual and damage that was done to the body. It is important to know this because it is easy to get frustrated when symptoms linger, which increases relapse rates. There is an option for treatment of PAWS with the use of Iboga, an herb that possesses powerful anti-addictive properties. Iboga can help a person physically by detoxing their body of residual chemicals. It also binds to receptor sites in the pleasure center of the brain, the same part of the brain that most addictive drugs affect. Iboga can help you mentally and spiritually by allowing you to work on underlying issues that is causing the addictive behavior. Iboga stays in an individual’s system for months, which is a critical time and when most relapses happen. Iboga can be a powerful tool to aid a person through these though times. PAWS is also a reason why Iboga Wellness Center offers a 30 day program for people that have been on longer acting opiates or people that have many years of opiate abuse. Please see our protocol for Suboxone and Methadone iboga treatments.